Danger is one of the most defining aspects of motorsports. It’s been that way since the first “motoring contests” of the late 1800s, and it’s probably going to be true forever. The very fact that it involves huge, metal projectiles being driven around a course at high speeds while people stand around and watch means it’s going to be inherently unsafe. Drivers accept that risk, but in the most unfortunate of cases, the spectators are the ones who get hurt. As with past racing tragedies, the men and women behind the sport will have to take a closer look at what happened on Saturday and examine ways to make sure it doesn’t happen again. 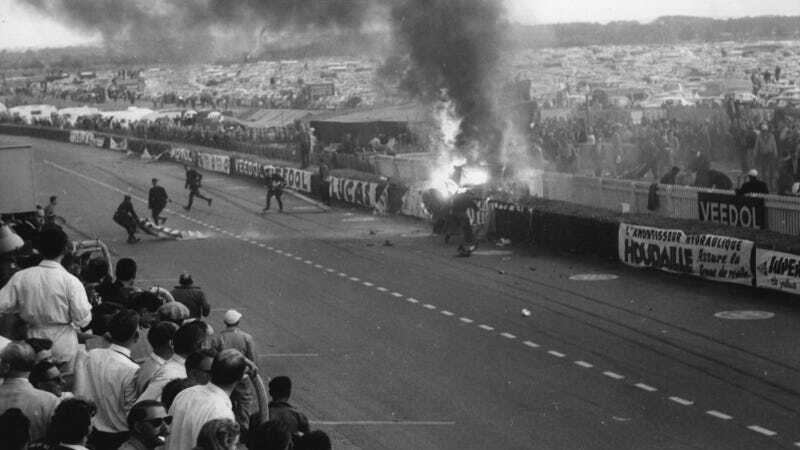 Widely considered the worst disaster in all of motorsports history, 83 spectators and a driver were killed, and 120 others were injured, when a Mercedes-Benz 300 SLR racecar hit an Austin-Healey from behind and was flung into the air. The car struck an embankment and somersaulted end over end, spraying flaming wreckage into the crowd. The driver, Pierre Levegh, died after being flung from the car. The horrific accident caused Mercedes-Benz to withdraw from factory-sponsored racing for decades. For a time, auto racing was even banned in several countries until changes were made. The wreck also sparked a massive sea change in both car and track safety, many of which remain in place today. Rally racing tends to be inherently dangerous to spectators because they usually don't sit behind fences — they stand on the side of the road as cars blast past them at insane speed. That's why it's not terribly uncommon for the fans to get hurt. One of the worst examples of this occurred at the Safari Rally in Africa, where nine non-competitors were killed in various different stages. Spectator deaths at rallies continue to happen from time to time, like the Tara Hill Climb in Serbia last year, where three people were killed. The VisionAire 500K was a race that used to be on the IRL calendar at the Charlotte Motor Speedway. In 1999, the race's second year, a two-car crash launched tire debris into the stands, killing three people. Nine other fans were injured, one critically. The race was never held again. The year before that, three fans were also killed under similar circumstances at a CART race at the Michigan Speedway. Both incidents led to curved fencing that catches debris and tethers that connect the tires to the car in IRL. NASCAR also uses tire tethers, although tires did come off in yesterdays' crash. The crash that led to the advent of restrictor plates and slower speeds in NASCAR occurred at the Talladega Superspeedway in 1987. Driver Bobby Allison's car lifted off the track while going in excess of 200 mph, sending him flying into a fence and scattering debris into the crowd. Fortunately, no spectators were killed, but it was a "close call" that led to the lower speeds and tighter running packs we see in NASCAR today. Some drivers argue that this situation isn't safer at all. In a race to to the finish line, Carl Edwards was involved in one of NASCAR's most violent crashes of all time when his car went airborne and flew upside-down into the fence. Edwards was unhurt and ran across the finish line on foot, but seven fans were injured when debris flew into the stands. One woman had to be flown to a hospital by helicopter. Eight people died and a dozen others were injured in this night-time desert race in 2010. One of the trucks lost control and careened into the crowd. A report by state officials faulted the federal Bureau of Land Management for not following their own safety procedures for the race they sanctioned. So what does all of this mean? Should we outlaw all auto racing because it's dangerous to drivers and spectators? Absolutely not. I don't want to live in world without racing. No drivers or true fans would want that to happen, either. But when things like this do happen, we just have to learn from it so it can be prevented in the future. Hopefully that's what will happen after this weekend as well.